TPID contains extensive information about native and a few selected naturalized plants that have value for landscape restoration, especially erosion control and wildlife use. Information is provided through the Texas Plant Information Database (TPID). The database is structured to allow the user the opportunity to query and select best-suited plant species based on specific site characteristics and management objectives, which could vary from individual yard plantings to large area restoration. 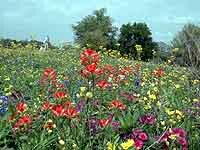 Listed species include trees, shrubs, vines, forbs, grasses, and marsh plants and, when planted in appropriate associations, can provide vegetated landscapes similar to those that naturally occur in Texas.